If you are looking for a propane supplier in Eden, you need to find a reliable company. But what makes for a reliable propane delivery service? A dependable supplier will be safe, have good customer service ratings, and offer service plans that include regular propane delivery. Whether you are looking for a propane supplier for the first time due to a move or a new furnace, or if you are unhappy with your current supplier and want to find a new company, you can follow these tips to get quality propane delivery in Eden. Propane is a fuel, which means that it is flammable. All fuels must be burned in order to create heat or energy, whatever the goal. When it comes to handling flammable fuels, safety is of utmost importance. Propane delivery companies have safety regulations in place that protect employees and customers alike. State and national safety regulations apply to all fuel companies. Every company has a safety record that they should be able to provide if asked. State regulatory agencies should be able to vouch for a company’s safety record. A reliable company will stay up to date on all new regulations and laws regarding propane distribution. 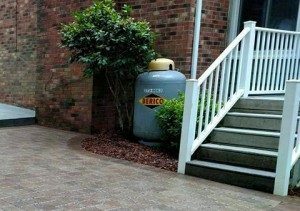 The safety of you and your family relies on your propane delivery service. For any company with which you do business, you expect good customer service. Good customer service includes polite and knowledgeable representatives, on-time deliveries, and honest business practices. You can read reviews on Angie’s List, Yelp, and other online resources, and ask friends and neighbors about their experiences with propane suppliers. You can check any company’s status with the Better Business Bureau, which rates business on their customer complaints and resolution, among other criteria. In Eden, NC, and the surrounding area, Carolina Fuels is a very reputable propane delivery service. Our good reputation in North Carolina is based on the excellent customer service we have provided to the area since 1924. We offer something that other fuel suppliers in the area don’t: full service heating and cooling repair, maintenance, and installation. Why is this an advantage? Because as one reliable company, we can provide for all aspects of your heating and cooling. You can enjoy the convenience of making one call for maintenance, repairs, fuel delivery, and even new equipment installation.